Some of these towers have been specifically built for observation purposes these are the buildings that really stand out in a city’s skyline due to the saucer like shape of the observation spaces. The most famous examples of these kind towers can be found in the USA and Canada. 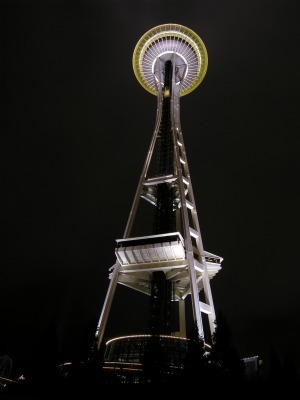 The futuristically named ‘Space Needle’ in Seattle stands at 605 ft and was the tallest building in the Western United States when it was built in 1962 to mark the World Trade Fair taking place in the city that year. What makes this building really unique is the glass lined observation point at the top of the tower that rotates 360 degrees, thanks to a small electric motor; this feature is particularly popular with those dining in the towers restaurant. The significantly taller CN Tower over in Toronto Canada performs a similar role to the ‘Space Needle’ but on a much bigger scale. Standing at 1,815 ft tall the CN Tower has a ‘Sky Pod’ that is open to the public and features an outdoor observation deck with a glass floor, something that offers direct views of the streets 1,000 ft below. This glass floor has an area of 24 square metres and features insulating glass units that can withstand pressures of 595 pounds in weight per square inch. Many of the visitors who brave walking over the glass floor don’t normally have a fear of heights, but some experience acrophobia – a fact that illustrates just how high up this observation point is. 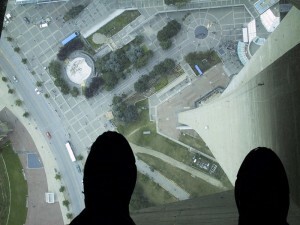 Safety is the most important part when installing glass flooring in tall buildings like the CN tower and Pilkington glass technicians are thought leaders in developing glass products that can withstand heavy weights. Safety focused products from the Pilkington range, such as fire resistant Pilkington Pyrostop® and Pilkington Optilam™ can be considered as potential solutions for glass flooring. Additionally, observatory buildings like the ‘Space Needle’ would benefit from having Pilkington Activ™ self-cleaning glass installed as the danger and cost of frequently cleaning the windows on such tall buildings would be reduced significantly.